A beautiful thing happened today. Teachers at Maria Saucedo Scholastic Academy voted unanimously to refuse to administer the Illinois Standards Achievement Test (ISAT). Since teachers at Garfield High School—and then several other schools in Seattle—voted to boycott the MAP test last year, there has been an explosion of activism against high-stakes, standardized tests. And yet outside of Seattle, there had not yet been another school where the entire staff collectively raised their voice and boycotted a test—that is until now. The brave teachers at Saucedo Elementary are taking up the struggle and using the power of collective action to refuse to waste students’ valuable class time with another destructive test. As the teachers have pointed out, getting rid of the ISAT would leave the students with still a plethora of standardized tests, including the MAP tests, new Interim Benchmark Tests, REACH Performance Tasks, ACCESS tests, NAEP tests, pilot Common Core tests and more. Already, hundreds of parents at Saucedo have pledged to opt their child out of the ISAT. With the Parents and teachers united in this struggle, Saucedo is now on the front lines in the battle for authentic assessment. They will need our support. Please take a minuet and sign the petition in the defense of the Saucedo educators—then send it on to everyone you know who believes that education should be about critical thinking, imagination, joy, and collaboration—not about rote memorization and eliminating wrong answer choices. Corporate education reformers will use their wealth to publicize the idea that you teachers are selfish and your refusal to give the test will damage students. They will complain that teachers don’t want to be held accountable and that high-stakes standardized is the key to improving education. Don’t listen to them. They are pushing these tests because it is a multibillion dollar industry and because reducing the intellectual process of teaching and learning to a single score is the centerpiece of their plan to label the public schools as failing and then push their privatizing agenda. Instead, listen to the many thousands of parents, students, and teachers around the nation that are supporting you in this struggle to assert that our children and educators are more than a test score. The corporate education reformers, and the politicians they have bought, will issue threats of discipline for your audacity in refusing to hand the schools over to testing companies. They threatened us in Seattle when we refused to give the MAP test, but we showed that the power of solidarity can overcome the powerful. Not a single teacher was disciplined and the MAP test was made optional through our struggle. We scrapped the MAP. You can Ice the ISAT! Where can I get the story on this. I want Yes! to go after it and put it up on the web. Jesse, in Chicago, CPS has already admitted that the ISAT serves no purpose this year while at the same time claiming that it is somehow useful. 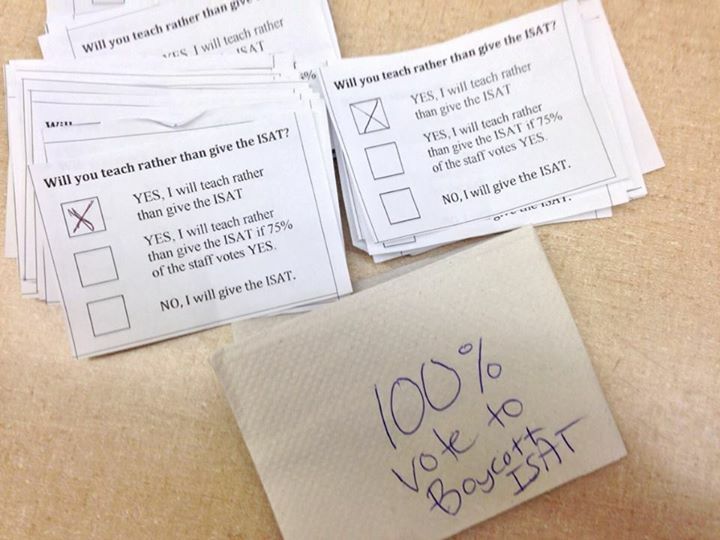 It is obvious that principals are being coerced to lie about the ISAT, and it seems likely that the primary reason for this is to prevent the idea of opting out of tests from spreading. The party line from our unfortunate principals has changed from “This years test will be 100% common core aligned” to “The ISAT ‘FORMAT’ for reading and math are 100% aligned to the common core state standards. I’d love for anyone in the top leadership of CPS to explain to us all what it means to have an aligned ‘FORMAT’. Could it be that they are both bubble tests? LOL what nonsense. I and others are fully aware of things like Rhee’s op ed in the Seattle times where she completely misrepresented and lied about the facts and motivations that teachers had leading up to Scrap the MAP and the eloquent and restrained response on the Trance Encounters blog and other places where it was thoroughly debunked. Pingback: Chicago teachers at Saucedo Elementary vote unanimously to boycott the Illinois Standards Achievement Test: We scrapped the MAP! You can Ice the ISAT! | I AM AN EDUCATOR | Scrap the MAP! I constantly spent my haalf an hour to read thi website’s content every daay along with a cup of coffee.